This couple had been yearning to have children for years. After several attempts, they decided to go the adoption route. They were then selected by a birth mother, but all of a sudden things took a turn. The ultrasound revealed not just one child, but three! Obviously the decision to adopt one child is a big one, but three? Well, the husband was all for it, they always wanted kids and now they could have them all at once! But the surprises didn’t end there. 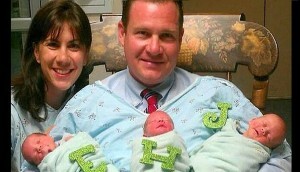 The triplets were born, and a week later the wife received some news. She finally became pregnant. Once again, the surprises didn’t end there. She was pregnant, with twins! While they were anxiously awaiting one child, they suddenly all at once are expecting five! No doubt this is something they never could have anticipated happening, but there’s also no doubt they see it as a huge blessing! What a way to start off parenthood!